This report is an effort to analyse the large amount of data collected by Vodafail.com regarding the major issues affecting customers of Vodafone Hutchison Australia (VHA) from October 2010 to January 2011. The report aims to provide an insight into scale and complexity of those issues, the causes and the potential resolutions that may be acceptable to the affected customers. Due to the nature of these problems and the lack of concrete information regarding all areas of Vodafone’s business, this report is written from the perspective of the public and of consumers. This report will be released to the public and submitted to the Australian Competition and Consumer Commission (ACCC) and the Australian Communication & Media Authority (ACMA). The report may be used to assist other regulatory and policy agencies in the telecommunications sector. Vodafail.com is a website started by Adam Brimo in response to his frustrating experiences with Vodafone’s customer service shortly after signing a 24-month contract. The website was launched on December 12 2010 and enabled Vodafone customers to share their experiences and issues in an open and anonymous forum. After first being promoted on Facebook, Twitter and Whirlpool; the website was covered by the Sydney Morning Herald (SMH)  on December 17 2010. Shortly thereafter on December 27 2010, the SMH  ran a follow-up story on Vodafail.com and the possible class action being investigated by Sydney law firm PiperAlderman. Vodafail.com became one centralised place for customers’ to express their anger at Vodafone as a result of national media coverage of the issues. This is turn led to a meeting between and arranged by VHA Chief Executive Officer Nigel Dews and Adam Brimo on December 29 2010. From its simple beginnings the Vodafail website has grown significantly over the past month and provides a number of features including collaborative coverage mapping (most recently, the ability to check the Vodafone coverage for a particular post code), on-hold/wait time data, the ability to rate and reply to posts along with information on how to lodge complaints against Vodafone. Vodafail.com has had over 150,000 individual visits and 450,000 page views in little more than three weeks, due largely to media reports and social networking sites. The Vodafail team is currently comprised of four regular contributors along with additional media and legal consultants when required. All members of the team are volunteers and financial backing is provided by Adam Brimo. The website initially utilised online advertising to cover the rising costs of website hosting however once those costs were covered, the advertising was removed. Vodafail.com is not affiliated with any telecommunications companies, receives no incentives from other mobile carriers and rejects all offers for affiliate marketing. Vodafone customers have reported numerous problems with the services they have been provided. Vodafail has recorded complaints from some customers who say they have been experiencing problems with the network for up to 12 months, however the majority of complaints against Vodafone have occurred from October 2010 through January 2011. From an analysis of the stories posted on Vodafail.com, the following issues have been identified and will be discussed in further detail in this report. The numbers in parentheses relate to the number of complaints logged on Vodafail. Vodafone’s current situation appears to be the result of underlying network issues, poor customer service exacerbated by the difficulty customers have both getting in contact with Vodafone and the lack of accurate information being made available by Vodafone. These problems fall into three broad categories essentially encompassing all areas of Vodafone’s business yet their overall impact on the customer’s experience is cumulative. Vodafail received a number of reports from customers who have been billed incorrect amounts, charged for erroneous usage and incorrectly charged account termination fees. These issues were compounded by the unreliability of Vodafone’s online account and billing system (myVodafone), which has had intermittent outages in December 2010 and January 2011. In some cases the incorrect amounts being charged are the result of excess data usage that the customers believe they could not have incurred. Some customers have reported that network problems caused their SMSs to be sent multiple times and that they were charged for each of those messages. These reports also note that upon contacting customer service and going through their bills, some of the charges have been reversed and Vodafone has confirmed they were overcharged. Incorrect advice by the call centre has also resulted in unexpected amounts being charged to customers. Customers experiencing dropped calls found themselves being charged the flag fall and minimum call charges for each time they retried their call. This extra cost has resulted in higher bills for a number of customers who have reported their experiences on Vodafail. A customer reported that the mobile broadband software provided by Vodafone recorded different data usage than Vodafone’s own bandwidth monitoring system. Vodafone’s monitoring of a user bandwidth resulted in 25-30% higher usage than was reported by the supplied Huawei software, resulting in higher bills for customers closer to their limit. These wide-ranging billing issues require a general investigation into the billing of services provided by Vodafone to ensure that customers are being billed fairly and appropriately and that all new contracts are clearly articulated to customers. A few customers have alleged that Vodafone staff suggested they move to a more expensive "capped" plan but were not informed that they would be signed on to new 24-month contracts. Other customers reportedly signed up to a deal that offered three months free service, which many customers believed to be the first three months, however later discovered the free months were counted in months four, five and six of the contract. Vodafone customers have reported a plethora of issues relating to all aspects of their mobile phone service. However the reception issues are worse for those who rely on the Vodafone 3G network, as evidenced by recommendations from Vodafone staff members to turn off 3G for fewer dropped calls and better reception. More than half the comments received by Vodafail relate to reception and network problems. The Vodafail coverage-mapping facility, whereby individuals provide details about coverage in their area that is then aggregated into a coverage map, has received over 16,000 contributions. Vodafone measures dropped calls by analysing the number of times a customer calls the same phone number in quick succession. If two calls to the same number occur immediately after one another then the successive redialing would classify as a dropped call. This process of measuring dropped calls was articulated to Adam Brimo in a telephone conversation with a member of the Resolutions Team on December 21 2010. However despite recent customer complaints, Vodafone alleges its official dropped call percentage has remained steady at 0.7% over the past six months  . Regardless, the number of customer complaints has been significant and customers have reported on their level of reception on Vodafail. 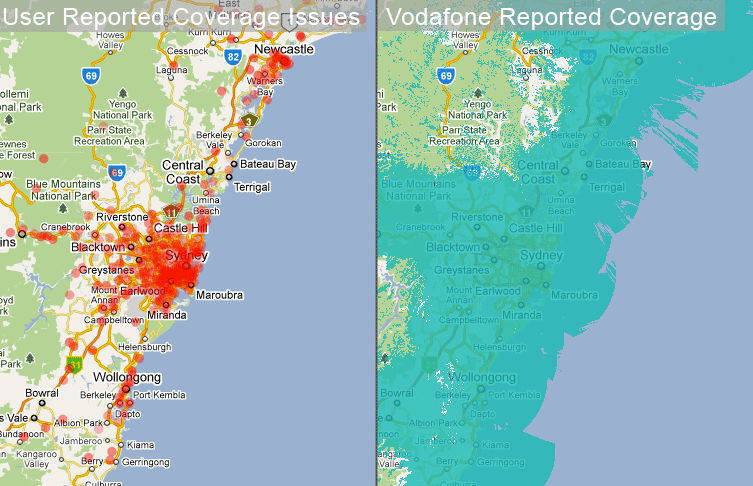 The maps below detail the wide discrepancy between the network coverage Vodafone claims to have (right) and the coverage reported by Vodafone customers in the Sydney region (left). The image on the right has the areas Vodafone claims to have network coverage for marked in blue, the image on the left has areas marked in red where the average reception of respondents is less than 40% (or ‘two bars’ on their handset). Some customers have reported experiencing periods of no reception on their mobiles for hours at a time and the inability to make calls even while their phone appears to have reception as indicated by their handset display. These complaints also detail how customers repeatedly try to make calls only to have them disconnect or drop out after a few minutes. The customers experiencing these problems are sometimes quite distressed as they are unable to contact their families in the event of an emergency or accident. Other customers have determined the financial impact of delayed voicemail and the inability to make calls to be detrimental to their business. A summary of the coverage data collected by Vodafail is available in the appendix under ‘User Reported Reception’. Customers in numerous complaints have derided the Vodafone customer service available via calling 1555 (using mobile) or 1300 650 410 (using landline). These complaints identify wait times in excess of two hours when contacting the customer care line for phone support. Other complainants detail the inability of staff at Vodafone retail outlets to provide any after-sales support for network issues. In the past, Vodafone’s staff have denied the existence of any network issues and there was an overwhelming tendency for technical support staff to classify those network problems as handset issues. Some of the grievances posted on Vodafail have received replies from Vodafone employees, particularly retail staff members. Although these posts have been made anonymously Vodafail has tracked the IP addresses to Vodafone retail stores and received written confirmation that the replies originated from at least one store. The replies follow consistent themes and appear to reiterate the following common messages. These replies and comments are typical of the responses many customers have received from Vodafone and therefore represent Vodafone’s persistent underlying refusal to take customers’ complaints seriously. Vodafone’s denial of network issues and the lack of disclosure regarding their network upgrade plans may have resulted in mixed messages to their customer service staff. The Customer Care staff may have been unaware of the network issues affecting Vodafone customers, and their job was made more difficult by their overseas location. Therefore, instead of attributing customer complaints to network issues, the Customer Care staff across the board blamed the smartphones themselves, particularly the iPhone. The disconnect between Customer Support staff and customers, the difficulty in reaching Customer Support and the frequent misdiagnosis of issues led to an overwhelmingly poor experience for customers. Many of the complaints received by Vodafail depict a customer service department that was ill-equipped to deal with the large amount of inquiries and ill-advised on the real problems with the Vodafone network. This lack of information led to perennial and unhelpful suggestions that users restart their phones, replace the SIM card or live with the issue in hopes that it would be fixed in the coming weeks (despite little knowledge of the actual network plans). Customer anger at the long wait times was also directed at the automated voice recognition system that uses a voice called ‘Lara’. As many customers would terminate their call to customer service before it was answered, Lara was the only voice / person with whom they could “interact”. Some customers reported difficulty in speaking with the automated voice recognition system and Vodafone later reintroduced the choice to use the number pad to select which service is required. The customer service centre itself is outsourced and located overseas. There have been reports that customer service operatives providing support had difficulty understanding some of the customers due to different accents of both parties. This difficulty is exacerbated for people of a non-English speaking background. The structure and lack of transparency on Vodafone’s behalf make it difficult to analyse the current situation and determine its real causes. The potential causes identified in this section are based on first-hand research and information provided by former and current Vodafone employees along with publicly available information on the company. On February 9 2009 Vodafone and Hutchison Telecommunications (Australia) Limited announced that they would merge and become Vodafone Hutchinson Australia (VHA). With this announcement the CEO of the merged entity, Nigel Dews, declared that the company would achieve $2 billion in synergies and become the number two mobile operator (by subscribers) in Australia in two years  . However VHA, both by the composition of the senior executive team and its business strategy appears to more closely resemble that of Hutchison/Three than it does Vodafone. Multiple anonymous former employees, speaking in confidence to Vodafail are of the opinion that the business culture and strategies adopted by VHA appears to have largely come from Three. Retail staff allege they were impacted by the merger as some staff were forced onto casual contracts with lower wages than their previous permanent award agreements. The ability of staff to earn a commission on sales was apparently hindered by additional key performance indicators (KPIs) and individual sales targets were removed in favour of store-based targets. The combination of reduced wages and lower commissions appears to have impacted the morale in Vodafone stores and caused many staff to leave. This reduction in costs may have been a desirable result for VHA as a significant portion of the synergies in the merger would be a result of fewer retail stores and fewer staff. Vodafone has not communicated directly with its customers regarding the network issues it has experienced over the past few months. Vodafone has been affected by what it describes as intermittent issues and software problems that have caused outages across Australia. However the company only acknowledged these issues once a significant number of customers complained about their service  and following widespread media coverage, where customers began to realise they weren’t alone in experiencing these problems. The issues first began appearing on a somewhat regular basis in October 2010 and continue to this day. Communication between Vodafone management with its retail staff members, customer service and Vodafone dealers regarding the existence of network problems has been seriously inadequate and has greatly contributed to the current problems Vodafone is experiencing. Vodafail has learned that important information regarding the issues affecting customers was withheld from frontline customer service staff, preventing them from providing the correct service advice to customers. A Vodafone dealer contacted Vodafail stating that the existence of network issues was at first denied and then claimed to be fixed within 24 hours by a Vodafone dealer representative. This denial created a difficult situation for retail staff that had to sell Vodafone services and then explain to customers why they were having network problems. A current Vodafone staff member, speaking in confidence, confirmed that the call centre was moved off shore in recent years to reduce costs. However the employee also expressed sympathy for call centre staff who they believed were not properly trained on Vodafone’s systems and are not aware of the problems affecting customers. The conflicting advice received by customers and provided to customer facing staff appears to result from a lack of internal communication between key areas of Vodafone’s business. With the slow retirement of the 3 brand, VHA has encouraged Hutchison/3 customers to migrate to the Vodafone network at the expiry of their contracts. With Hutchison’s roaming agreement with Telstra due to expire in 2012 and the cost savings gained from the retirement of the three brand, VHA has focused on moving customers off the 3 network. Meanwhile Vodafone is still heavily relying on its joint 3G network built with Optus for a substantial portion of its 3G network. In 2007 Optus began building a newer 3G network to provide higher speeds and greater coverage. VHA formally announced plans in October 2010 to build more than 1400 new network sites across Australia in an effort to increase capacity and coverage. Since the merger, VHA has acquired over 1.1 million new customers, increasing its customer base to over 7.43 million. Some 2.3 million customers use the company’s 3G services with either a handset or mobile broadband device at the end of June 2010, up from 1.05 million in June 2009. Due to the lack of public disclosure regarding the direction of Vodafone’s annual capital expenditure, it is not possible to know if the investment is closely aligned with customer growth. Greater public disclosure around the capacity of individual towers is required to make a more informed judgment on the role customer growth has had on the poor performance of the network. In July 2009 VHA CEO Nigel Dews declared that the company would be the number two mobile communications provider in Australia in two years. This declaration appears to have been the catalyst for the drive to acquire new customers through ultra-competitive pricing. In November 2010 Vodafone announced their “Infinite” plans that provided unlimited national calls, txt messages and higher data allowances. The growth in customers and 3G services for the period through December is not available however Vodafone has increased their marketing efforts with visible advertising everywhere from sponsorship of the Ashes test series, TV and radio commercials, to out-of-home advertising at bus stops and major supermarkets. The ubiquity of Vodafone’s aggressive marketing strategy has only heightened some customers’ anger at the current situation. Some customers are upset to see Vodafone advertise a service that they believe cannot be provided. The constant advertising is also a reminder to Vodafone’s existing customers of the service that they themselves aren’t receiving, yet paying for. Most of the problems afflicting Vodafone do not have an immediate solution or resolution however there is no doubt that a number of the problems Vodafone is experiencing could have been alleviated through better communication with its customers. These communications should be sent directly to all customers, whether they have been affected or not. Implementing these steps effectively requires proper monitoring systems to determine exactly when and where a fault in a service has occurred. Vodafone initially denied the existence of network issues. They eventually apologised via their blog after a significant number of complaints were received. This approach resulted in a great deal of uncertainty from customers over delayed voicemail, dropped calls and late SMS messages. Vodafone’s network status page was also not updated with all of the specific issues customers were experiencing or in which geographical areas they were occurring. The company has since updated their network status page web page more frequently however the majority of Vodafone’s 7.43 million customers would not know to check that page. Vodafone’s current stance is that the network and service problems are intermittent and only affecting customers on an individual basis. This stance requires individual customers to negotiate a resolution by contacting Vodafone on multiple occasions. A far more efficient resolution would be to inform all customers of the nature of the problems affecting some customers and provide a set of resolution options. These options might include reduced charges while network issues are affecting customers or the ability to cancel their contract without charge. While all problems have their own characteristics, a standard set of options should be available to all customers when there are ongoing service problems. Customers would then be free to choose the best option for them, whether that is a discount on their account or the cancellation of their contract. Having these options clearly articulated and easily executed would reduce the amount of time customers must spend speaking to customer service and reduce the number of complaints to the Telecommunications Industry Ombudsman. Although the ease with which customers could leave their contracts is likely to result in a larger number of cancellations it would generate some goodwill with customers. On December 21 2010, Nigel Dews apologised for the ongoing network issues that were affecting some customers. While apologising was an important first step, it appeared to do little to allay customers’ concerns over the ongoing issues they were having. Therefore it is important that any apology is matched with significant actions that can be seen by customers. The entire process took two months, from when the incident was first discovered to when the improved product was available to consumers. Vodafone’s problems first became publicly evident almost three months ago and it is still unclear exactly which areas have been impacted by poor network coverage and which customers are receiving incorrect bills. In the first instance of widespread problems, Vodafone should have investigated and informed all customers of the potential that their service could be impacted. Although the action resulting from any investigation will not be immediate it is important to provide regular information on those actions to allay customers’ concerns. Vodafone’s handling of its customer’s complaints and the subsequent public relations crisis should serve as a warning to any business. A failure to put customers first, immediately address customers’ concerns and communicate transparently to the public can be detrimental to a brand and the company’s reputation. The environment in which businesses operate is very different today than it was just five years ago. Communication is faster and more efficient, secrets are more likely to be exposed and complex technology is becoming a commodity. All organisations must take notice of this changing business environment or risk unforeseen customer backlash. Vodafail.com is not the first website designed to raise awareness to a particular issue and it will certainly not be the last. However Vodafail is a single-issue campaign and it will not be expanded to include other companies or industries. It’s original goal, to raise awareness of the issues affecting Vodafone’s customers has been achieved with help from the media and the public. I have been greatly humbled by the attention it has received and thankful of the reception with which it was greeted. I am personally grateful to the support of my family, my partner Melissa Ran and the generous effort of David Clifford and Travis Symonds along with all of the other contributors who have stood up for this cause. My hope today, as it has always been, is that Vodafone acknowledges and remedies the issues which sparked the creation of Vodafail. Those issues have been acknowledged by customers, Vodafone employees and their affiliates and I hope they are soon resolved. As the volume of posts and traffic to Vodafail decreases I am looking forward to returning to my normal life. However the website will remain as a reminder that the customer’s voice cannot be ignored and that products and services must live up to the public’s expectations. The following emails have been received by Vodafail.com. I work for VHA and I am glad that someone has given us all a voice. SInce the merge- there has been nothing but issues. As a staff member, I have never once had a reply when it comes to anything significant like network issues. We are not involved in the class action and it appears to just be an investigation at this time, not an actual lawsuit. We are hoping that the media attention surrounding these issues will bring about some change in the way VHA has operated (within the company and externally) and the service it has provided to customers. I have been 'raising' these issues for the past 2 months to no response.. I feel bad when people blame the call centre - they arent trained very well and dont know alot about vodafone systems. *content removed for anonymity* since they moved the call centre offshore due to cost cutting, i believe the call centre are treated unfairly. Firstly thank you and well done for what you are doing for the community against Vodafone. I am a small dealer of Vodafone services located in *PERSONAL DETAILS REMOVED*. I have been here for *PERSONAL DETAILS REMOVED* I have connected hundreds of commercial and personal contracts. For this I obtain a “airtime” kickback of 3% and an extra 4% if I hit my bonus. Vodafone has always had a reasonable reputation in the local area and I have always been open and honest with my clients/ friends. I have never signed anyone up knowing they will be getting a bad service due to where they live or work> We do all compliance checks and appreciate any feedback from our customers. If they are unhappy we go to bat for them against the principal "Vodafone" and get them out of their contract. We have done this on many occasions and have a very good reputation for not leaving people high and dry. I have several affected services and am working with the TIO now to get my contracts terminated and get on to Telstra so at least I can field calls and address my clients. I am sure the TIO will assist me due to the circumstances an my loss of earnings due to no or pitiful reception just 2kms from the *PERSONAL DETAILS REMOVED*. What my problem is this, I cannot see Vodafone bouncing back from this demoralising publicity and I cannot see them offering a service that is up to par with what they promise. I have recently refinanced my property to give the business a cash flow as our sales and so on are dropping dramatically. I am now over $$$$ in the RED and cannot continue to pay wages and rent if this keeps going on. I have heard all the excuses from Vodafone saying it will be fixed in 24 hours blah blah blah, these are straight out lies and deceptive comments. I simply cannot repeat these statements to my clients/ customers. I am sure make that certain other small dealers are feeling the same hurt and we are going broke due to their dodgy network. If they had of told me months ago they were experiencing prolonged periods of issues I would of shut up shop and be done with it. I aim to fight for what is rightfully mine and I will undoubtedly be required to close my shop and sack my staff.. I would settle for my airtime I would of accrued had they have a satisfactory network and no issues and would seek to balance out what it is owed to the bank. Thus I will be suing VHA for $$$$ not a penny less and am happy to work with anyone or body who needs a whistle blower as I have years of dealings with their methods and tactics. “This morning we’ve been made aware that a law firm is soliciting for customers to come forward in a class action in light of recent network issues. The most important thing we can do is to remain focussed [sic] on improving our customers’ experience of our network, and keep working with our customers, individually, to understand their experience, resolve it and make it up to them. There’s no higher priority than making sure customers are happy with their service and we are all very sorry that some have not been happy recently. We are also in contact with the ACCC and other consumer groups to advise them of what we are doing to improve network performance and service to our customers, and we are keeping our customers across changes through our website. Our network performance is improving and we are confident that things will get better as we continue to roll out extra capacity across our network. Vodafone customers have voluntarily reported the amount of time they spent waiting on hold for Vodafone customer support. The average, shortest and longest wait times are in minutes. This table shows the number of stories posted on Vodafail broken down by city and state. Only cities with more than ten posts and that can be traced to a city are shown. This table shows the reception of Vodafone customers as they have reported on Vodafail.com. Only postcodes with a sample size of greater than twenty different people are reported. The perceived reception for voice, Internet and broadband services are stated as a percentage. The columns marked as 850Mhz and 2100Mhz indicate the number of new towers that are being installed or upgraded in Q1 of 2011 as provided on Vodafone’s network status page. Vodafone Company Overview. Vodafone Hutchison Australia. 12 Jan. 2011 <http://vodafone.com.au/personal/aboutvodafone/companyinfo/companyoverview/index.htm>. Moses, Asher. Furious Vodafone customers spark ACCC probe. 17 Dec. 2010. Sydney Morning Herald. 10 Jan. 2011 <http://www.smh.com.au/technology/technology-news/furious-vodafone-customers-spark-accc-probe-20101217-190gl.html>. Moses, Asher. Vodafone customers to sue in class action. 27 Dec. 2010. Sydney Morning Herald. 11 Jan. 2011 <http://www.smh.com.au/technology/technology-news/vodafone-customers-to-sue-in-class-action-20101227-1982f.html>. The dropped call percentage has been provided by an anonymous Vodafone employee and therefore cannot be verified. Bingemann, Mitchell. & Lee, Tracy. Phoney forecasts: Vodafone fights to stay in the mobile race as Telstra, Optus tear away. 1 Dec. 2010. The Australian. 15 Jan. 2011 <http://www.theaustralian.com.au/business/industry-sectors/phoney-forecasts-vodafone-fights-to-stay-in-the-mobile-race-as-telstra-optus-tear-away/story-e6frg9hx-1225963523816>. Crozier, Ry. Vodafone blames 3G data issues on soft upgrade. 17 Nov. 2010. ITNews. 14 Jan. 2011 <http://www.itnews.com.au/News/238932,vodafone-blames-3g-data-issues-on-soft-upgrade.aspx>. Winterford, Brett. WA outage the latest in Vodafone\'s horror run. 13 Dec. 2010. ITNews. 14 Jan. 2011 <http://www.itnews.com.au/News/241577,wa-outage-the-latest-in-vodafones-horror-run.aspx>. Vodafone Hutchison Australia appoints Nokia Siemens Networks in Major Network Boost. 6 May 2010. Nokia Siemens Networks. 14 Jan. 2011 <http://www.nokiasiemensnetworks.com/news-events/press-room/press-releases/vodafone-hutchison-australia-appoints-nokia-siemens-networks-i>. Olsen, David. Ericsson wins contract to upgrade VHA’s network. 20 Jul. 2010. Dynamic Business. 14 Jan. 2011 <http://dynamicbusiness.com.au/articles/articles-news/ericcson-vodafone-hutchinson-network-1824.html>. Favero, Melissa. 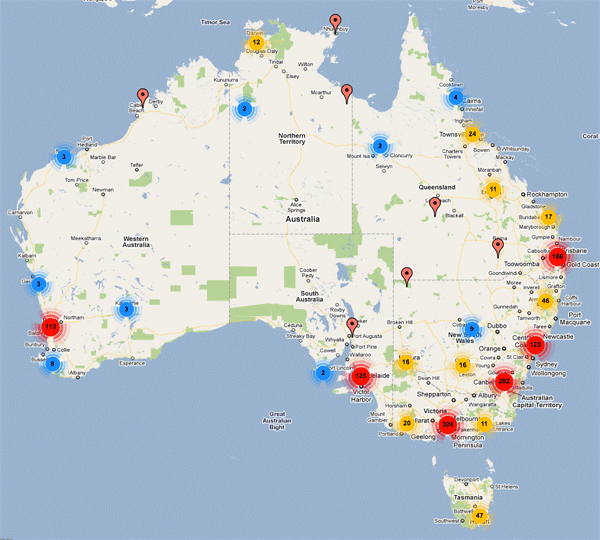 Optus announces bold expansion of its 3G mobile network across national footprint. 30 Jan. 2007. Optus. 14 Jan. 2011 <http://optus.com.au/aboutoptus/About+Optus/Media+Centre/Media+Releases/2007/Optus+announces+bold+expansion+of+its +3G+mobile+network+across+national+footprint>. Budde, Paul. Australia - Telco Company Profiles - Vodafone Hutchison Australia Pty Ltd . Bucketty NSW: Paul Budde Communication Ptd Ltd, 2010. No Author. Media Release: Vodafone Infinite Plans. 16 Nov. 2010. Vodafone Hutchison Australia. 14 Jan. 2011 <http://blog.vodafone.com.au/blog/news/media-release-vodafone-infinite-plans/>. Helbig, Koren. NAB offers compensation for pay crisis. 29 Nov. 2010. Perth Now: Sunday Times. 18 Jan. 2011 <http://www.perthnow.com.au/business/news/no-one-should-be-out-of-pocket-nab/story-e6frg2qu-1225962716300>. Lardinois, Frederic. Skype’s Outage: A Lesson in How to Handle a Crisis in the Age of Social Media. 23 Dec. 2010. NewsGrange. 14 Jan. 2011 <http://newsgrange.com/skype%E2%80%99s-outage-a-lesson-in-how-to-handle-a-crisis-in-the-age-of-social-media/>. Dews, Nigel. An apology to our customers. 21 Dec. 2010. Vodafone Hutchison Australia. 14 Jan. 2011 <http://blog.vodafone.com.au/blog/news/an-apology-to-our-customers/>. Rehak Judith. 2002. Tylenol made a hero of Johnson & Johnson : The recall that started them all. The New York Times, [online] 23 March 2002. Available at: <http://www.nytimes.com/2002/03/23/your-money/23iht-mjj_ed3_.html> [Accessed 12 January 2011].